Please keep in mind that this information is not meant to be used in lieu of taking the purple martin to a Licensed Wildlife Rehabilitator. 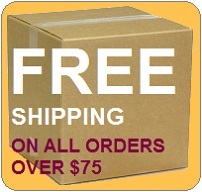 It is designed to answer basic questions and prevent injury to the purple martins by any incorrect actions. 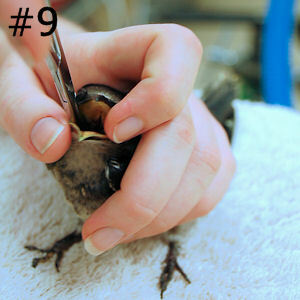 It is also meant to buy time until the bird can be brought to a Rehabilitator. As a federally protected bird, an injured purple martin should always be brought to a rehabber as quickly as possible to assure the best possible outcome. 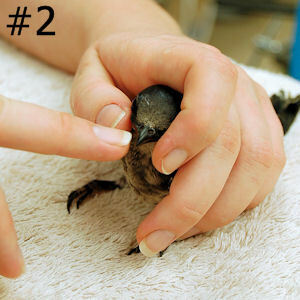 NEVER attempt to feed a bird that appears asleep, semi or unconscious. Martins that are dehydrated should be hydrated before offering food. Feeding a dehydrated bird can be fatal. Please read our article on Hydration of Purple Martins. Supplies you will need for feeding purple martins: You will need a pair of forceps or hemostats. If using dried crickets they should be soaked in Gatorade or water to soften. The purple martin is being held gently in the left hand. 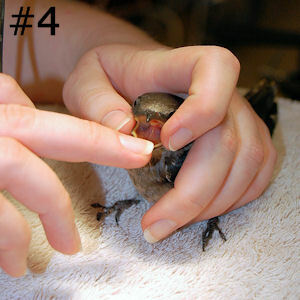 Feeding on a supported surface such as a table will give the purple martin something to grasp other than your fingers. 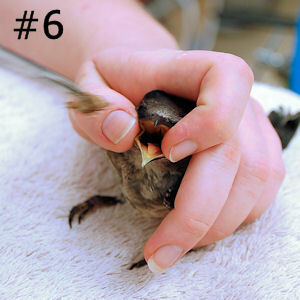 The index finger of the right hand is used to open the birds beak. 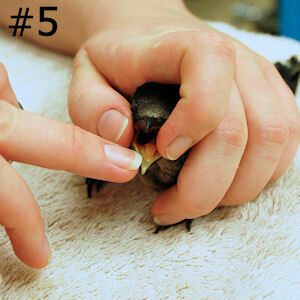 Using the tip of your fingernail to separate the purple martins lower beak from the upper beak. Notice the thumb and index finger of the left hand holding the purple martin. The mouth is opened gently. 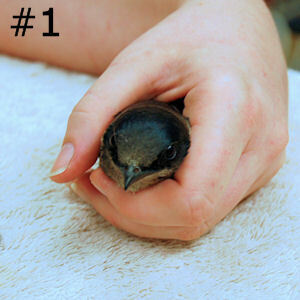 The thumb and index finger are used to gently keep the purple martins beak open. Be careful to not cause any twisting of the birds beak by supporting the head. Pressure should be straight up and down, NOT any sideways motion. 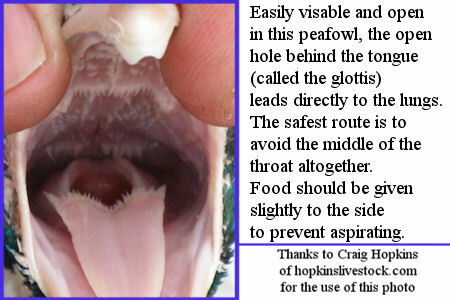 The food is introduced into the purple martins mouth on a pair of hemostats or forceps. (dull tweezers may also be used. The crickets (food) is placed in the birds mouth away from the glottis or "airway", to the side of the tongue. The food is deposited past the end of the tongue to keep the bird from shaking it out of the mouth. 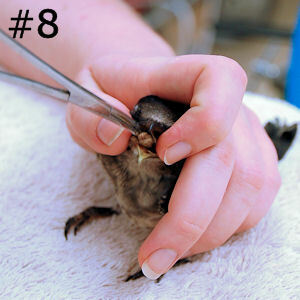 After the food is in the throat release the beak to allow the bird to swallow. 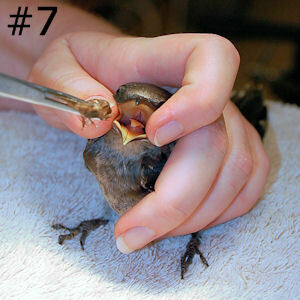 Wildlife rehabilitators are highly trained to prevent the largest complication caused by force feedings...aspiration. When food or fluids enter the airway. 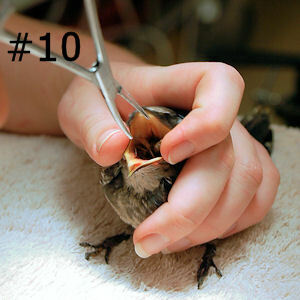 Click HERE to locate a wildlife rehabber near you. Remember that a rehabber is the best choice to help the purple martin survive. If you are simply unable to locate a rehabber close to you and you are fearful or unsure about feeding the martin...DON'T feed it as you may cause more damage than help. There are other options. 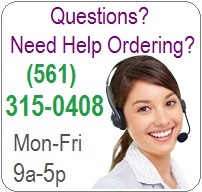 You can contact another more experienced landlord that lives close by, you can call a rehabber on the phone and they may be able to talk you through helping the martin or you can contact a local avian veterinarian and ask if they will assist. 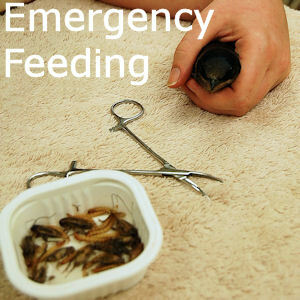 Feeding a dehydrated bird can be fatal. Please read our article on Hydration of Purple Martins. Aspiration pneumonia is 100% fatal. Many thanks to Faith & Vered Nograd, CVT of the Folke Peterson Wildlife Center, Rehabilitators extraordinaire. Purple Martins all over are forever in your debt.